Shown below is a set of five retrogradationally stacked parasequences in mixed carbonate and siliciclastic mudstone facies. In this example, thickly bedded carbonates represent shallow subtidal facies, interbedded carbonates and mudstones were deposited in deep subtidal facies, and mudstone facies indicate offshore facies. Each of the flooding surfaces is indicated by a yellow line. The lowest of these surfaces is also a sequence boundary. The uppermost flooding surface occurs at a bed with unusually well-developed evidence of stratigraphic condensation, including phosphate-coated siderite intraclasts, pyritization, and abundant and diverse bioclasts. 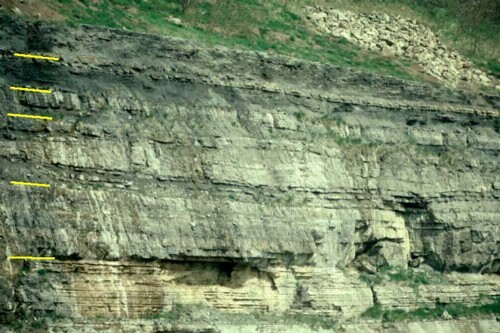 This photograph was taken in the Mississippian Bangor Limestone along I-24, just southeast of Monteagle, Tennessee.